Many people want to help our Aussie wildlife but just don't know where to start. This page is full of easy ways that can really make a positive difference to wildlife. Take a browse through this page and you'll see how easy it is for you to Help Our Wildlife. 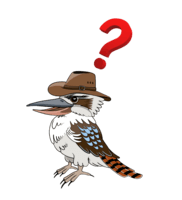 What can You do for the Wildlife of The Land Down Under? If you come across injured or sick wildlife, before you do anything, you should contact an animal welfare group to find out the best course of action to take for the type of wildlife that you have found. While you are waiting for advice, keep the animal warm and in a dark, quiet place. Only handle it as absolutely necessary and do not give it food or water unless advised by the carer and keep pets away. Often many people want to help out our native plants and animals, but don't know where to start. We can all help the Flora and Fauna in many ways, by simply putting a bird bath and bird feeders in our gardens. Keep your pets either inside or locked up at night. You can volunteer your time at zoos, sanctuaries, animal parks and conservation organisations like Earth Watch - there is always plenty to do. Adopt an Animal through the zoos, parks, marine centres and adoption agencies - the money goes to helping out the organisation with the costs of keeping the animal and also research and conservation efforts helping the whole species. Wildlife Shelters always need help. They can always do with blankets, feeding dishes, financial aid and even a helping hand - especially during times of natural disasters such are bushfire, flood and droughts. Even the branches from a fallen tree can often be used by wildlife shelters, bird and wildlife parks - contact your nearest wildlife shelter, they may be in need of branches for the wildlife in care. Possums, gliders, bats, birds and many other species of wildlife need branches from all sorts of native plants, not just fallen trees. Next time you have a big pruning job, ask your shelter if they could use the clippings, especially things like flowering natives as they make a great food source too. What interests you? Plants, animals, maybe marine life? See what's in your local area and call them up, I'll bet they could use your help - when we all do a little bit, we make a BIG difference! Your time, donations or aid can mean the difference between life and death for some wildlife, even help stave off the threat of extinction. There is possibly someone around your area who you could offer your time, donate equipment or supplies, or other organisations that you could make a donation too. It can also be as simple as clearing weeds and non-native plants and replacing them with indigenous plants that are native to your area. Turning your garden into a native garden really does bring all sorts of wildlife to your yard. These gardens offer food and shelter for a range of different species and you get the benefit of having wildlife visit you! Plastic Rio Basket or Cardboard box (preferably with lid) for transporting injured animal to vet or Wildlife Shelter. ALWAYS make sure the animal is secure. Ribbon or string to tie around nearest post / tree. If you are unable to stay with the animal until the rescuer arrives, this will make finding the injured animal easier. Personal safety is first and foremost. Injured animals don’t know if you are going to help them or harm them. They may kick, scratch or bite. If you are in a vehicle, turn your hazard lights on. Try to warn oncoming vehicles to slow down. Speak quietly and try not to frighten the animal. Remember that injured wildlife will be very scared and in pain. Keep all pets away. When it is safe to do so, move the animal off the road. If it is dead move it well away from the road to avoid a second kill. Birds such as eagles and hawks like to feast on dead wildlife. Kangaroos, wallabies, possums, koalas and wombats are often killed on roads leaving orphaned pouch young still alive. Carefully remove the orphan and follow the advice below. If the animal is small enough wrap it in a towel or place it in a beanie or pillowcase before putting it in a well - ventilated, secure cardboard box or container. (Pad the container with towels, a blanket or a jumper to make it nice and comfortable) An injured or orphaned animal will be in shock so it is vital they be kept warm, dark and quiet. Take it to a vet or wildlife shelter immediately. For larger animals you may need to call for assistance. There are several 24 hour emergency hotlines operating in Victoria. They are able to offer advice, put you in touch with the nearest Wildlife Shelter, Vet Clinic or interstate organisation, or organise to have a volunteer rescuer attend. 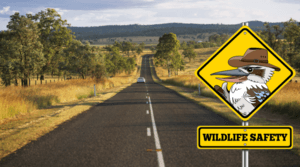 List of Wildlife Rescue & Shelters around Australia. If possible, stay with the animal until help arrives. If unable to do so, the exact location must be highlighted eg. tying something bright to a post or tree, drawing a large cross in the gravel or by placing large sticks to form an arrow. Make it obvious for a rescuer to immediately spot it. Animals will often crawl away and hide. Kangaroos with broken legs have been found as far as 1.5k away. Injured animals are easily predated upon, usually by foxes. Foxes are not merciful killers. They will first eat the tastiest bits like the tongue, then tear open the pouch of a female roo to get to her milk, leaving the animal to suffer a prolonged, cruel death. Vixens will take a live joey back to the den for her cubs to practice their killing technique. Please - show compassion and do the right thing even if it means being a bit late. Your First Aid will determine whether an animal lives or dies.